WICHITA’S AIRPORT: What’s in the Name? 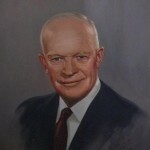 Dwight D. Eisenhower made more extensive use of airplanes than virtually any of his predecessors, so naming an airport in his home state after him isn’t really all that unusual. The former general and 34th President was from Abilene, Kansas, and he even learned to fly himself. His granddaughter, Mary Jean, points out that, as President, he held a pilot’s license…but not a driver’s license! Still, that’s probably not a good enough reason, by itself, to re-name the Wichita airport in his honor. Critics tend to point out that he was an Army general, not an Air Force officer and his connection to the Air Capital was therefore, a bit tenuous. They even suggested that there might be some other prominent Wichitans who might warrant more consideration as long as we were considering re-identifying the airport in the state’s largest city. They would note that he didn’t even fly to Wichita when he returned to his childhood home. He would land in Kansas City and drive out to Abilene. It’s true he didn’t frequent Wichita even as an adult. There is, however, evidence that he made a couple of campaign stops here and there are still a few people in town who remember seeing him drop into town both as a military officer and as a presidential candidate. On one occasion, for instance, he visited Boeing at the old Municipal Airport (now McConnell Air Force Base) in 1951 to see a demonstration of the Boeing Scout , a post war trainer. where he posed with a pair of native American shop foremen, Gordon Bushyhead and Francis Stumblingbear, for a publicity photo. Ike, who had been reactivated during the Korean Conflict, wore his general’s uniform. The two Boeing workers donned buckskins and headdresses from a local costume shop. The picture made it into the newspapers. The Scout, on the other hand, never made it into mass production. Ike didn’t make many more visits to the Boeing plant, either. 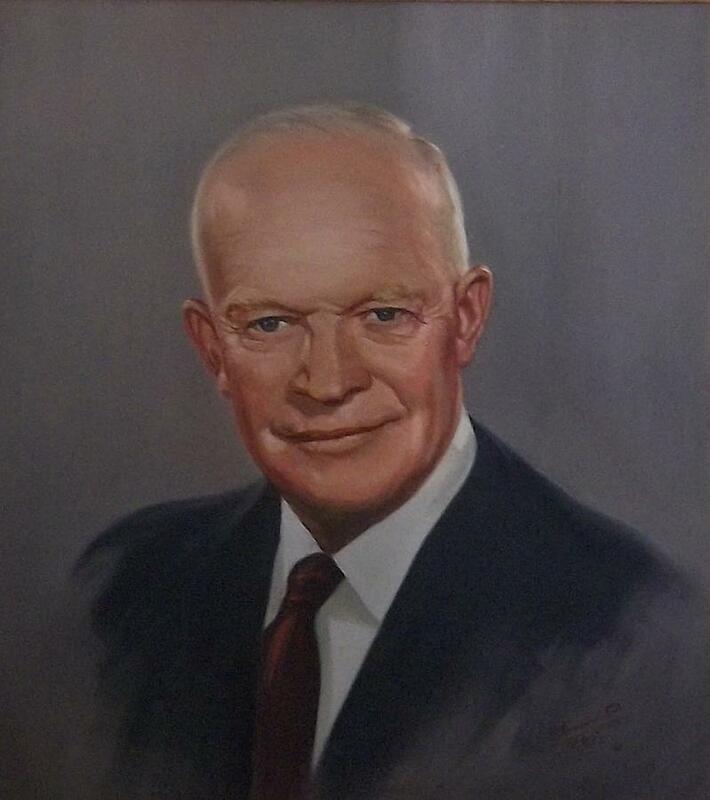 When President Eisenhower was elected to the White House he made a number of trips west to visit family. In fact, in what would be unheard of today, he spent six weeks at the home of a family member during the Summer of 1953. It happened to be his wife’s mother, in suburban Denver, Colorado–not Abilene, Kansas–so the closest he came to Wichita on that occasion was to fly over on the way to and from Washington. But, Ike did learn to fly and, as his great grandson, Merrill Eisenhower Atwater told me during the celebration of the new airline terminal at the airport that now bears his name, he made numerous trips through Wichita to Abilene and logged hours in the Kansas skies as a pilot in command, as well. His logbooks, in fact, are on file at the Eisenhower Presidential Library in Abilene. Being elected the President of the United State gave Ike a leg up on other Kansans in the competition for the title of our state’s most prominent citizen, but probably ranks him at least second when it comes to consideration for Kansas’s most famous aviator. That probably goes to Amelia Earhart. Chances are, if she had returned from her ill-fated 1937 circumnavigation of the globe, the sentiment for naming the airport in the Air Capital might well have tilted in her direction instead…assuming Atchison hadn’t already claimed it! n learned to fly himself. His granddaughter, Mary Jean, points out that, as President, he held a pilot’s license…but not a driver’s license! Still, that’s probably not a good enough reason, by itself, to re-name the Wichita airport in his honor. Critics tend to point out that he was an Army general, not an Air Force officer and his connection to the Air Capital was therefore, a bit tenuous. They even suggested that there might be some other prominent Wichitans who might warrant more consideration as long as we were considering re-identifying the airport in the state’s largest city. They would note that he didn’t even fly to Wichita when he returned to his childhood home. He would land in Kansas City and drive out to Abilene. It’s true he didn’t frequent Wichita even as an adult. There is, however, evidence that he made a couple of campaign stops here and there are still a few people in town who remember seeing him drop into town both as a military officer and as a presidential candidate. On one occasion, for instance, he visited Boeing at the old Municipal Airport (now McConnell Air Force Base) in 1951 to see a demonstration of the Boeing Scout , a post war trainer. where he posed with a pair of native American shop foremen, Gordon Bushyhead and Francis Stumblingbear, for a publicity photo. Ike, who had been reactivated during the Korean Conflict, wore his general’s uniform. re made it into the newspapers. The Scout, on the other hand, never made it into mass production. Ike didn’t make many more visits to the Boeing plant, either. bears his name, he made numerous trips through Wichita to Abilene and logged hours in the Kansas skies as a pilot in command, as well. His logbooks, in fact, are on file at the Eisenhower Presidential Library in Abilene.